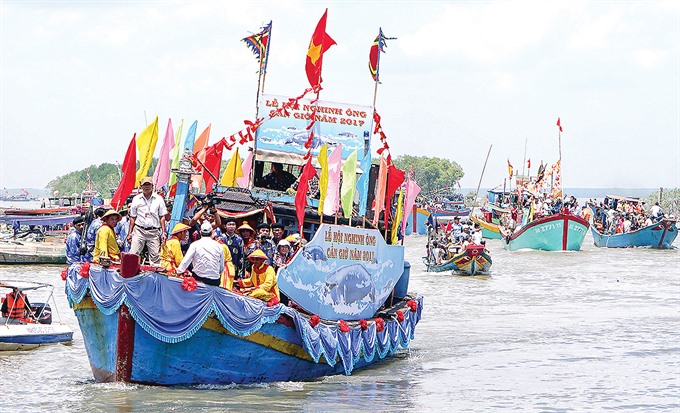 HCM CITY — HCM City’s coastal district of Cần Giờ will host its annual Nghinh Ông Festival from September 23-25. The festival will open with a music gala featuring songs and dances in praise of the country as well as the culture and lifestyle of Cần Giờ’s residents at a park in Cần Thạnh Town on September 23. The show will present cải lương (reformed opera) and hát bội (classical drama) performances by the Trần Hữu Trang Cải Lương Theatre and the HCM City Hát Bội Theatre. The performers from two troupes will offer several extracts from famous plays for local people and tourists during the festival. A procession on land and at sea followed by local residents in traditional costumes and dozens of fishing vessels will be held on September 25 (or the 16th of the eigth lunar month). The procession will take place at Ông Thủy Tướng Temple (Temple Worshiping the Whale) and move to the sea. The ritual aims to show fishermen’s respect to whales that help them at sea, as well as worship of whales for a bumper fish catch. People later will visit Rừng Sác Martyrs’ Cemetery to worship national heroes and soldiers who sacrificed their lives to protect the country. A release of lanterns to the sea to pray for a good fish-catching season will also be included. The organisers will host exhibitions showcasing photos and objects which feature fishing activities, and the Cần Giờ mangrove forest, a world biosphere reserve which was designated in 2000. A food festival, folk games, sports, and a Mid-Autumn festival for local children will be also included. The Nghinh Ông Festival is organised by the city’s Department of Culture and Sports and Cần Giờ District People’s Committee. It was recognised as a national Intangible Cultural Heritage in 2013. It is the only traditional festival for fishermen held to celebrate their fishing career. The event helps to promote tourism in Cần Giờ, as well as nurture young people’s love for Việt Nam’s sea and islands.